ClickWork is a no-nonsense, very-easy-to-use Time Tracker. ClickWork enables you to track the time spent on different activities. Step one is the creation of an activity, which will create a transparent pushbutton, called an activity button in ClickWork. Next, you drag the activity button to another spot in the window. Then, simply click on the activity button and ClickWork will start tracking the time spent on that activity. Simply click once more on the activity button to stop the tracking. Or click on another activity button to end the tracking of the current activity and start tracking the clicked activity. Simply drag an activity button to the trashcan, once you no longer need to track that activity. But of course, there are many very-easy-to-use features and reporting facilities. In addition to various obvious activity reports for management you can also print statistical reports and even display graphs, either within ClickWork or using Excel. In version 1.5 users can be given access to only a subset of the functions. The possibilities are almost limitless, without becoming complicated. Simply define some 'access profiles' and assign them to the users. Also new in version 1.5 is 'password on entry'. It is disabled in the default access profile, but it can simply be activated. Perhaps the most important new feature in version 1.5 is the manager option. A 'manager' has the right to view and manage the data of a span of users. This enables the manager to produce multi-user reports and graphs. Also, the manager can build a predefined Activities List. Users can choose from this list when creating an activity button. 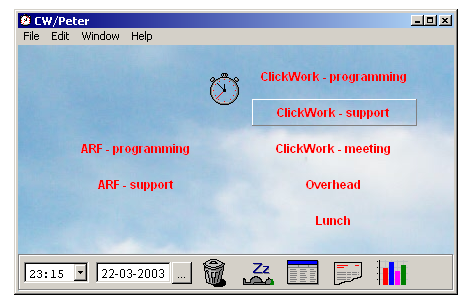 ClickWork is meant for experienced, professional PC-users who spend a substantial part of their working day at a computer. For this reason and because ClickWork is very intuitive, the helpfile is kept minimal and only contains useful tips about features that are less obvious. But don't underestimate it. The help is always context sensitive and in version 1.5 it even fully adapts to the user's access profile, meaning that no help texts are available with regard to options that are not available to the user. You can download the Trial Version, which is full featured and without any time limit. You will occasionally see a text that it is a trial version and reports also display that text. Once you have decided to accept ClickWork as your definitive Time Tracker, you can buy one or more License Keys. There is an extensive and powerful licensing scheme, enabling you to scale ClickWork exactly to your current and future needs. In essence, a license key tells ClickWork to allow concurrent use by x users within the department. Since an installation of ClickWork can act upon more license keys, additional license keys can be bought at any time and simply added to the same installation. For example, suppose you already own a license key for 4 users and you add a license key for 8 users, then you will have an installation that allows 12 users. When you add another license for 8 users, you will have an installation for 20 users, and so on. Each buy comes with a table about the license keys, that you can import in, for example, Excel and that will help you in administering which departments are using which license keys. Copyright © 2005 ViaFox, All rights reserved.